The earliest personal computers used 8-bitCPUs (central processing units). Apple, Commodore, Rockwell, and Atari designed their computers around the MOS Tech 6502; Radio Shack’s Color Computer used the Motorola 6809; and most others, including the Radio ShackTRS-80 and all CP/M computers, used the Zilog Z-80 or Intel 8080. All ran in the 1-4 MHz range and could address up to 64 KB of memory. Next came 16-bit chips. One of the earliest to achieve popularity was the Intel 8088, a 16-bit CPU on an 8-bit data bus, which IBM chose for its first personal computer. Although this meant memory access was slower than on the earlier 8086 with its 16-bit bus, it made for a cheaper motherboard. The 8086 and 8088 could address up to 1024 KB (1 MB) of memory in 64 KB banks (this means they worked similarly to the older 8-bit chips that used bank switching as chunks of data and program code had to fit within 64 KB blocks of RAM). IBM designed its PC architecture to provide up to 10 banks (640 KB) to the user, leaving the remaining 6 banks (384 KB) for hardware, such as video cards, drive controllers, and I/O cards. After all, who would ever need more than 640 KB of memory? Apple thought differently from IBM and adopted a different chip, the Motorola 68000. The biggest advantage of the 68000 over the Intel 8088 and 8086 is its huge linear address space. Mac Portable and PowerBook 100. Unlike the 8088 processor with 16-bit internal registers, 20-bit memory addressing (16 banks of 64 KB for a 1 MB maximum), and an 8-bit data bus, the 68000 has 32-bit internal registers, 24-bit memory addressing, and a 16-bit data bus. That means it can read twice as much data in a cycle and access 16 times as much system memory. In an interesting historical tidbit, IBM seriously considered the Motorola 68000 when developing the IBM PC but chose to use Intel’s 8088 to keep costs down. That was a big consideration, at IBM was not sure that the personal computing revolution had legs. 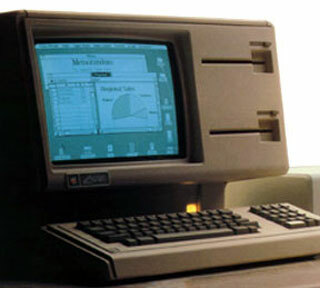 Apple first used the 68000 in the 5 MHz Lisa, moving to the 8 MHz version when it introduced the Macintosh in 1984. (This was the same year IBM introduced the 80286-based AT with a 16-bit data bus and 20-bit memory addressing, an architecture less behind the 68000 than the Intel 8088.) Apple used the 8 MHz 68000 until it discontinued the Mac Classic in 1992. The fastest Macs based on the 68000 were the Portable and the PowerBook 100, both running their CMOS 68HC000 CPU at 16 MHz. The 68000 was second-sourced to Hitachi, Mostek, Rockwell, Signetics, Thomson/SGS-Thomson, and Toshiba The 68000 was also used in business computers and workstations including Alpha, Sage, Radio Shack’s TRS-80 Model 16, HP 9000 Series 200, Apollo, Silicon Graphics, and Sun Microsystems. On the consumer side, it was also used in the Commodore Amiga, Atari ST. and Sinclair QL. It made its way into gaming as well, from arcade machines to gaming consoles including Sega System 16, SNK Neo Geo, and Sega Mega Drive/Genesis. The 68000 was also used in the original HP LaserJet and some Apple LaserWriter printers. Great CPUs, past and present, John Bayko. See especially sections on 8080/85, Z-80, 6502, 6809, 680×0, 80×86, ARM (used in Newton), PA-RISC, Sparc, Alpha, PowerPC, and Merced. The Sinclair QLdidn’t use the 68000, rather the 68008, which used an 8 bit data bus. This was done to cut the manufacturing costs as at the time the 68000 was considerably more expensive than that 68008. As it turned out this was a short sighted view as when the Apple Mac, Atari ST and Commodore Amiga launched, the price of the 68000 dropped to below that of the 68008. Also as the 68008 had an 8 bit data bus, it took up to 4 cycles to pull data into the CP (The 68008 was still 32 bit internally like the reat of the 680xx family), thus crippling the machine when running side by side with a 68000 machine at a similar speed.